I was originally going to make this with white wine, but then had a hankering for madeira so I mixed it up. So delicious and really easy! 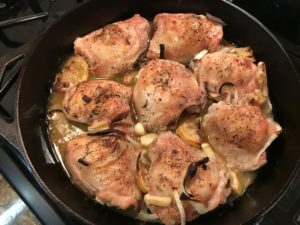 In a cast iron skillet, arrange chicken thighs. Add the garlic (cut side down) and1/2 tsp of the thyme and drizzle all with olive oil. Roast for 1 hour, or until chicken temp reaches 165°. Place the chicken on a platter. Place the pan drippings into a heat proof bowl. In the same pan, add about 2 tbsp olive oil. Sauté until softened. Add the Madeira and the bay leaf and 1/2 tsp thyme. Add the pan drippings. Add the roasted garlic (peeled) and bring to a boil. Let simmer over medium-low heat for 5 minutes, until reduced. Add the sauce to a blender and puree until smooth. Season with salt and pepper. Serve over chicken, with roasted garlic smashed potatoes (take clean baby potatoes and roast whole head of garlic (top removed) covered in olive oil, salt and pepper on a roasting pan for 25 minutes while chicken is cooking. Smash potatoes with the roasted garlic. Delish!) and sauteed spinach or string beans.